The Swiss Colony Fruit Cake Medley consists of three different variations on fruitcake: the Butter Rum fruitcake, the Macadamia Nut fruitcake, and the Original fruitcake. The set of three, half-pound fruitcakes costs $30.95, $41.18 including shipping for me. This puts these fruitcakes into the pricier range, but if you purchase just one type—the traditional, for example—the prices are competitive, with 1.25 pound fruitcakes starting at about $19. Shown at right, left to right: butter rum, macadamia nut, traditional. The ingredients for these cakes are the poorest of any I’ve reviewed so far, with many surprising entries that lead me to believe these recipes have been touched by food technologists. The most bizarre ingredient by far: turnips. Both the butter rum and the original have turnips in them. And to think people are afraid of citron. Additional ingredients that make me sad are things like corn syrup, invert sugar, high fructose corn syrup, artificial flavor, and turmeric. Turmeric is just weird—I’m guessing for color or possibly preservative properties. I did actually e-mail the Friendly Fruitcake Expert for some explanation for these unlikely ingredients, but so far, no word. To the good, the butter rum cake did feature butter quite high up on the list. The macadamia nut cake had (one would hope) macadamia nuts, but also included apricot kernels, I’m guessing to give it a bit of an almond flavor, which it did have. The original fruitcake, being a darker, more traditional fruitcake, had brown sugar, butter, and citron on its list—the other two were citron-free, focusing more on cherries and pineapple (and turnip). As for flavor: eh. The butter rum had a sweet, pineapple upside-down cake and cherry flavor. There is actually rum in the butter rum, which does give it a bit of depth of flavor, but it’s very faint. The macadamia nut cake is tasty and reminds me of the pineapple cakes that I’ve sometimes had from Chinese or Taiwanese bakeries. The dough is very un-fruitcake like; instead, it’s more like shortbread, very light in color and crumbly. The cake has got an almond, syrupy, fruity flavor, and the macadamia nuts give it a nice nutty flavor and bite. This is a good tasting cake, but it really isn’t a traditional fruitcake. 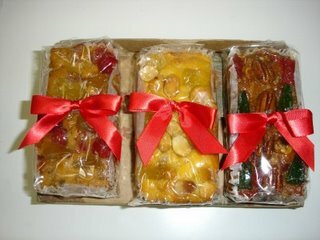 The traditional fruitcake uses smaller chunks of fruit than those in the butter rum. Walnuts and pecans both appear higher in the ingredients list here and are noticeable—you can smell and taste the nuts. There is a sweet caramel scent to this cake, more of that praline or burnt sugar flavor, probably from the brown sugar in the ingredients. However, the flavor in general resembles that of a light fruitcake rather than the dark, liquor-infused cakes. I wonder, frankly, how much turnip I taste. The presentation of these three fruitcakes was mighty cute, I have to say. These definitely had brighter color fruit and batter than the monastery fruitcakes, but were not as intensely pecan-filled as the Collins Street fruitcake. I’d choose the macadamia nut cake as something different, but the other two were pretty mediocre—once again, I can see where people get their biased opinions of fruitcake. For the quality of ingredients I’m getting, I’d prefer to spend my turnips on something other than turnips. These babies look so good, it's a shame they didn't taste as good. Maybe it was the turnip. Will you do a tasting of the Italian style fruit cake? I can't remember the name, but it was very light in color. Is there such a thing as egg-free fruitcake? If so, what is the best one you can recommend? I can't remember the last time I actually had any fruitcake, but those look good. Or maybe it's just the big red bow on each of them that's catching my attention. Anyway, those would probably be good with some hot chocolate or cider on a cold fall/winter day. Maybe I should check some of them out. I have ordered various items from Swiss Colony for about 10 years. Slowly but surely the prices increased to the point that I no longer order anything from them. However, on my last order a year ago, I tried the fruitcake that actually came with a guarantee that it would be replaced if unsatisfactory. When I received the cake and unwrapped it, it crumbled, broke into crumbly pieces that hit the kitchen floor. I believe it was so old and dried out that it was from the prior year. Horrible!!! Well, I hope you got your money back!